Cisco plans to combine Spark and Webex to provide a single platform for team collaboration and web conferencing. Cisco Webex Teams and Webex Meetings will rely on the same cloud infrastructure and user interface for online meetings. According to the press release from Cisco, “the name ‘Webex’ is synonymous with the word ‘meet’.” Cisco claims that Webex is the “gold standard when it comes to real-time meetings and getting things done.” While I can’t attest to Webex being a gold standard, I can admit that it is an incredibly popular solution, from a very trusted brand. Cisco goes on to explain that “more than six billion meeting minutes happen in Cisco Webex every month,” so clearly there’s some truth to their statement. And once you being to recognize the weight that the Webex brand carriers, it makes a bit more sense that Cisco went ahead with the naming change. 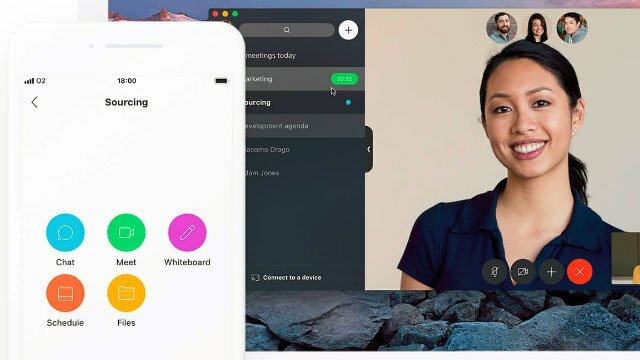 This convergence of Cisco Spark and Webex platforms was done to “Make it easier for teams to meet and get great work done.” By combining the Video Meeting capabilities of Webex, with the powerful team collaboration tools of Spark — whiteboarding, persistent messaging, file sharing, and simple guest access to name a few — Cisco has created a platform that more closely rivals Microsoft’s Office 365 and Microsoft Teams. But beyond simply converging the two platforms, Cisco has also went ahead and updated their existing Webex solution. Cisco claims that “the first thing you will notice about the new Webex Meetings is that it is ‘video first’.” Essentially, Webex will bug (read: encourage) users to turn on their camera. Instead of simply displaying a presentation, or slide show, Webex will now include hi-res videos of all participants within the meeting. This will work on all devices as well, whether you or your participants are using a laptop, Cisco video room device or even a mobile device. The idea is to turn Webex into a completely video first, video focused platform. Teams, on the other hand, is the collaboration and messaging aspect of the platform. But what’s really interesting is how you can include Teams functions and features inside the Webex platform by utilizing the Teams add-on. Or, for those that don’t want the video from Webex, they can simply use Webex Teams. Cisco also went ahead and introduced a new piece of hardware to go along with their new converged platforms. Known as Webex Share, this low-cost device is a “super-simple way for teams to share content on the big screen” in any space. Essentially, Webex Share allows users to utilize any TV or screen for their presentation, sharing files, slides and more. Cisco recognized that many, many huddle rooms and meeting spaces will have TVs, but these TVs are rarely, if ever, used. With the goal of making huddle rooms better, Cisco decided to introduce the Webex Share that enables teams to leverage their unused screens as powerful presentation and meeting tools. The whole concept is really simple: just plug the really small, palm-sized, adapter into the back of your TV, pair the system with your laptop or mobile device, and users can start sharing files to the screen instantly. Webex Share can even be used to schedule meeting rooms and check on the status of reserved rooms. Cisco said the device should be available by the end of 2018. Cisco has an end goal of injecting “AI into every meeting, every call, every conversation and every interaction that you have.” To achieve this widespread usage, Cisco is introducing the Webex Assistant (formerly the Cisco Spark Assistant) into all cloud-connected Webex Room Kit and Room Series devices. This one is really cool: The Webex Assistant will utilize AI to recognize when a distracting noise is being transmitted in your meeting — papers shuffling, background conversations, etc — identify the source, and then lower the volume of that source. This should help keep distracting noises to a minimum. The same AI will also recognize when that source is speaking, and automatically adjust the volume so they can be heard. Its really interesting to see Cisco introduce new functionality into their promising AI assistant — I personally am really curious to see just how far they can push this technology. And last, but not least, Cisco has also begun to shine some light on a new future roadmap for how the Webex platform will work with tools from other providers. In their announcement Cisco specifically highlights that Webex will soon be able to work seamlessly with tools from Google, Microsoft and even Slack.